In the citrus industry, juvenility and alternate bearing are serious problems that cause lengthening of the breeding cycle and instability of annual fruit production, respectively. Both phenomena are closely related to flowering behavior: juvenility is caused by suppression of flowering in young plants and alternate bearing mainly results from suppression of flowering by fruit production. Many researchers have conducted studies into citrus flowering in a quest to resolve these problems. In recent years, molecular and genetic approaches to studying citrus flowering have been performed on the basis of studies on flowering-related genes in Arabidopsis. In Arabidopsis, the protein encoding a flowering-related gene, FLOWERING LOCUS T (FT), plays an important role in the promotion of flowering. Similarly, a citrus orthologue of FT (CiFT) has been confirmed to have a function in the promotion of flowering in citrus. In studies of transgenic plants, a CiFT co-expression vector has been already used to shorten the juvenile phase of citrus. In addition, endogenous expression of CiFT is closely correlated with flowering under various conditions, suggesting that endogenous CiFT may regulate floral induction. Considering the accumulating data, the regulation of CiFT expression is hypothesized to be essential to understand the mechanism of citrus flowering and studies on CiFT are expected to contribute to the resolution of flowering-related problems in citrus. Flowering represents a phase transition from vegetative to reproductive growth. This phenomenon is one of the most important events in the plant life cycle because it is the initial stage in the sequence of producing a new generation. Generally, the timing of flowering is regulated by autonomous or environmental factors. In Arabidopsis, four major pathways induce flowering: photoperiod, gibberellin, vernalization, and autonomous pathways (Wilkie et al., 2008). In photoperiod induction, long-day and short-day plants flower in response to a change in the length of the dark period, requiring short and long dark periods, respectively. Gibberellin acts as a promoter of flowering and vernalization induces flowering in response to exposure to low temperature (between −1°C and 10°C) for an extended period. In the autonomous pathway, flowering is induced by internal cues at particular stages of plant development. In horticultural tree species, flowering seems to be rarely associated with photoperiod and vernalization (Wilkie et al., 2008). In many subtropical and tropical tree species, such as mango, lychee, macadamia, avocado, and orange, flowering is induced by cool temperatures. The temperatures required for flowering in such trees are about 15°C to 20°C and are higher than those required for vernalization in herbaceous species. Unlike subtropical and tropical trees, flowering is regulated autonomously in many temperate deciduous tree species such as apple. In the fruit industry, flowering behavior may cause serious problems. One such problem is juvenility. Many perennial woody plants have a non-flowering period lasting several years after germination. This long juvenile phase hampers traditional breeding and genetic studies. In citrus, top-grafting was developed to enable selection of new cultivars within a shorter period (Yoshida et al., 2005). This technique is helpful to shorten the juvenile phase and has been used in practical breeding programs. However, it still takes about 5 years from crossing to obtain fruit and select superior genotypes. Thus, repression of flowering in the juvenile phase precludes efficient selection of new cultivars in breeding programs. In genetic studies, transgenic plants can be used for functional evaluation of target genes, leading to manipulation of agronomically important traits. Juvenility also prevents rapid evaluation of the effects of the artificially introduced gene in reproductive tissues of transgenic plants. In fruit production, many perennial fruit trees often alternate between rich and poor crops in successive years. This phenomenon is termed alternate bearing (Monselise and Goldschmidt, 1982). Alternate bearing prevents a regular supply of fruit and has an economic impact on fruit industries worldwide. In Japan, fluctuation in annual fruit production is stronger in the citrus industry than for other fruit trees. This fluctuation results from a heavy fruit crop and late harvest in one season, reducing the flower number and fruit production in the following season. When trees bear few fruit or the fruit is harvested early, trees bloom profusely in the following spring. Consequently, once a tree trends towards a heavy or light fruiting condition, the tree may exhibit alternate bearing. Thus, problems in perennial fruit production such as juvenility and alternate bearing are closely associated with flowering. In citrus, to resolve these problems, many researchers have investigated the regulation of flowering. In recent years, an improved understanding of the molecular mechanism of flowering has been achieved in model plants. On the basis of these studies, genes associated with citrus flowering have been investigated. Accumulating data indicate that one flowering-related gene, citrus FLOWERING LOCUS T (CiFT), plays an important role in floral induction of citrus. This review first looks back at early work on citrus flowering before molecular approaches were developed, and then summarizes recent advances from molecular and genetic studies, with the focus on CiFT. Understanding citrus flowering is important for fruit production because it is the first step in the reproductive process. Phenology, morphology, and biology of citrus flowering have been well summarized by Davenport (1990). In spring, citrus produces three types of shoots: vegetative, generative and mixed. Vegetative shoots bear only leaves and generative shoots bear only flowers and no leaves. Mixed shoots bear both flowers and leaves. Generally, in most Citrus species, mixed and generative shoots initiate cell division and differentiation of floral primordium during mid-winter (Abbott, 1935; Nambu, 1934). Exceptions have been observed in some varieties such as lemon (C. limon) and shikikitsu (C. madurensis Lour. ), which flower intermittently all year round. In these species, the evocation of flower organ development is observed throughout the year (Nambu, 1934). Preceding the evocation of organ development, buds should be activated or depressed after interaction with exogenous or endogenous factors, which commits meristematic cells to the synthesis of specific structures such as inflorescence or vegetative shoots. We call this event “induction” and use “floral induction” for the initial events directing the transition from vegetative growth to the production of inflorescences. In floral induction, newly synthesized protein seems to begin the expression of the induced state. Then, the bud proceeds to an “initiation” stage, which involves biochemical and physiological events resulting from induction (Davenport, 1990). In this text, the word “evocation” is used for the histological and morphological manifestation, through cell division, differentiation, and elongation, of organ development, according to the definition by Davenport (1990). In citrus grown in Japan, it has been assumed that the most important period for floral induction is November (Iwasaki, 1959), but this remained unclear for many years. In around 1990, a method to evaluate the timing of floral induction was developed by Inoue (1989a, 1990b). He reported that the evocation of flower organs occurred by forcing sprouting at high temperature in potted satsuma mandarin (C. unshiu Marcow) trees grown outdoors until October or November (Inoue, 1989a). During fall, field-grown trees do not show any evocation in buds unless the trees are not subjected to high temperature. This finding indicates that floral induction occurs during fall and becomes visible by forcing the tree to sprout during fall and winter. Under field conditions, citrus trees never go dormant like deciduous trees but show a metabolic slowdown due to low temperature conditions during fall and winter. Because of this resting state, floral induction of citrus is believed to proceed invisibly during fall. In citrus, treatment with high temperature and removal of all leaves are sufficient to break the resting state and to force the tree to sprout (Inoue, 1990b). After forcing sprouting by high temperature and leaf removal, floral induction is visibly recognizable and the number of flower buds can be scored. Thus, floral induction can be monitored experimentally and it is demonstrated that floral induction occurs during November in Japan (Inoue, 1990b). Citrus trees, once past the juvenile phase, bloom every year. Annual flowering of adult trees is affected by several exogenous and endogenous factors. In citrus, cool temperature can induce flowering, as in most tropical and subtropical trees (Inoue, 1990b; Lenz, 1969; Moss, 1976; Nishikawa et al., 2007; Wilkie et al., 2008). In satsuma mandarin, floral induction occurs in trees exposed to 15°C for more than 1.5 months (Inoue, 1990b; Nishikawa et al., 2007). Trees generally remain in the vegetative growth phase until the trees are exposed to temperatures of less than 25°C (Inoue and Harada, 1988). Under field conditions, the trees are exposed to cool temperatures during fall, during which floral induction proceeds. Tropical climates do not exhibit sharp seasonal changes in temperature and thus in tropical areas citrus trees are not subjected to floral-inductive temperatures during winter as in the subtropics. In tropical areas, floral induction appears to be associated with water stress in the dry season (Reuther, 1973). Drought is known to induce flowering in citrus (Inoue, 1989b; Iwasaki, 1959; Nakajima, 1993; Southwick and Davenport, 1986). In Japan, flowering is sometimes induced by soil drought during summer (Iwasaki, 1959). Experimental cultivation of trees under controlled temperatures demonstrated that floral induction occurs under severe drought in trees grown at 25°C, which is otherwise a floral-suppressive temperature (Inoue, 1989b). In trees grown at 15°C or 20°C, which are floral-inductive temperatures, floral induction is enhanced to a greater extent by soil drought. Floral induction of citrus can be mainly caused by cool temperature or drought. Unless the tree is exposed to those conditions, it does not flower. In citrus, it has been reported that floral induction caused by cool temperature or drought can be affected by several factors described below. Citrus trees are evergreen but undergo defoliation when the trees are exposed to extreme cold in winter, salty wind injury, or severe drought. In defoliated citrus trees, the flower number in the following spring is reduced. This reduction in flower number is a result of repression of floral induction by defoliation (Inoue, 1990b; Iwasaki, 1959; Nishikawa et al., 2013). In citrus, the presence of leaves is likely to be essential for floral induction. Girdling and ringing are treatments that strip the bark from the trunk and cut through the bark without its removal, respectively. These treatments have been used in commercial citrus production to enhance flowering for many years. Those treatments are likely to repress the growth of vegetative shoots and roots, and promote floral induction in citrus (Goldschmidt et al., 1985; Inoue et al., 1991; Iwahori et al., 1990). Fruit removal also promotes floral induction (Garcia-Luis et al., 1986; Iwasaki, 1959; Nishikawa et al., 2012; Okuda et al., 1996). In satsuma mandarin, the presence of fruit on the tree results in a gradual inhibition of floral induction. Early thinning of fruit increases flower number in the following spring (Garcia-Luis et al., 1986; Iwasaki, 1959; Okuda et al., 1996) and the number of fruit on the tree is negatively correlated with flower number in the following year (Nishikawa et al., 2012). The effects of factors such as defoliation, girdling, and fruit removal seem to be associated with nutritional status. Defoliation causes a lack of supply of carbohydrate and fruit removal involves the loss of a major carbohydrate sink and accumulation of carbohydrate in roots (Okuda et al., 2002; Shimizu et al., 1978). Girdling causes accumulation of carbohydrate within the girdled branch (Goldschmidt et al., 1985). Thus, these phenomena have indirectly demonstrated the involvement of carbohydrate in flowering, and the carbohydrate factor has been discussed in correlation with flowering (Garcia-Luis et al., 1995; Goldschmidt et al., 1985; Martínez-Fuentes et al., 2010). In fruit trees, gibberellin (GA) inhibits flowering, whereas it generally promotes flowering in herbaceous plants (Wilkie et al., 2008). In citrus, GA inhibits both floral induction and evocation (Garcia-Luis et al., 1986; Goldschmidt et al., 1985; Inoue, 1990a; Monselize and Halevy, 1964). Inhibitors of GA biosynthesis have been demonstrated to promote flowering (Monselize and Halevy, 1964; Ogata et al., 1995). Endogenous GA levels in relation to flowering of citrus have been analyzed (Koshita and Takahara, 2004; Koshita et al., 1999; Ogata et al., 1996; Takagi et al., 1989; Yahata et al., 1995). Some reports indicate that endogenous GA levels are correlated with fruit bearing (Koshita and Takahara, 2004; Takagi et al., 1989). With regard to other plant hormones, it has been reported that endogenous levels of auxin and abscisic acid increase from October to December, and these hormones are detected at high levels within girdled branches (Koshita et al., 1999). Exogenous treatment with 1-naphthaleneacetic acid, a synthetic auxin analog, seems to promote flowering (Sato et al., 2007). Thus, in addition to GA, auxin and abscisic acid might control flowering in citrus. Cytokinin is indicated to promote bud break in citrus (Hendry et al., 1982), but not to regulate floral induction (Inoue and Ikoma, 1991). Exogenous treatment with 6-benzylaminopurine (BA) increases the number of sprouting nodes (Inoue and Ikoma, 1991). In BA-treated trees, the number of flowers per tree increases as a result of an increase in the frequency of sprouting buds. The number of flowers per sprouting node is not affected by BA treatment. During the past two decades, many flowering-related genes have been identified in Arabidopsis thaliana (Komeda, 2004; Pin and Nilsson, 2012). In Arabidopsis, several MADS-box genes, such as APETALA (AP) 1, 2, and 3, PISTILLATA, and AGAMOUS, are reported to establish floral organ identity (Robles and Pelaz, 2005). These floral organ identity genes are regulated by flower meristem identity genes such as AP1 and LEAFY (LFY) (Jack, 2004). These two genes have roles in the negative regulation of TERMINAL FLOWER 1 (TFL1), which regulates plant growth through the maintenance of indeterminancy of the shoot apex in Arabidopsis (Ratcliffe et al., 1998, 1999; Shannon and Meeks-Wagner, 1993). One MADS-box gene, SUPPRESSOR OF OVEREXPRESSION OF CONSTANS 1 (SOC1), integrates environmental and autonomous signals that regulate flowering time (Hepworth et al., 2002). Proteins of the FLOWERING LOCUS T (FT) gene and a rice homologue, Hd3a, act as a mobile flowering signal (Corbesier et al., 2007; Tamaki et al., 2007). FT is about 250 nt in length and encodes a 20-kDa soluble protein, which is homologous to the phosphatidylethanolamine-binding protein (PEBP) family. In angiosperms, PEBP homologues are divided into three groups: MOTHER OF FT (MFT), FT, and TFL1 (Kobayashi et al., 1999). In Arabidopsis, MFT and FT gene families have functions that promote flowering, whereas the TFL1 family has a function that delays flowering. In many plant species, FT homologues have been demonstrated to play a role in flowering (Pin and Nilsson, 2012). On the other hand, FT protein is reported to have non-flowering-related functions in some species, namely tuberization in potato, and bud set in poplar and conifers (Böhlenius et al., 2006; Gyllenstrand et al., 2007; Rodriguez-Falcon et al., 2006). Flowering-related genes characterized in Arabidopsis appear to be conserved in Citrus species (Dornelas et al., 2007). On the basis of data from Arabidopsis, citrus homologues of FT, LFY, AP1, TFL1, and SOC1 have been identified and characterized (Endo et al., 2005; Kobayashi et al., 1999; Nishikawa et al., 2007; Pillitteri et al., 2004a, 2004b; Tan and Swain, 2007). In the haploid genome of Citrus clementina, there are three loci encoding FT-like protein (Samach, 2012). Originally, we characterized citrus FT homologues (CiFT) based on cloning analysis and reported that three CiFT are expressed in satsuma mandarin (Nishikawa et al., 2007). However, according to the full genome sequence of clementine (http://www.phytozome.org/), two of the three we identified seem to be encoded by the same gene (Ciclev10013731m, renamed CiFT1) and the other is encoded by a different FT (Ciclev10012905m, renamed CiFT2) (Samach, 2012). Another third FT-encoding gene (Ciclev10012629m, named CiFT3), which was not identified in our earlier analysis, was found in the genome data set. In the deduced amino acid sequences, CiFT1 and CiFT2 show more than 95% identity while they have about 80% identity with CiFT3. In satsuma mandarin, the mRNAs for CiFT1 are strongly detectable in mature fruit and CiFT2 mRNA is detectable only in the stem and leaf tissues (Nishikawa et al., 2007). Homologues for LFY (CsLFY) and AP1 (CsAP1) in navel orange (C. sinensis L. Osbeck) show more than 65% identity with Arabidopsis LFY and AP1, respectively, in the deduced amino acid sequences (Pillitteri et al., 2004a). Expression of these two genes is high in reproductive tissues in navel orange. A citrus homologue for TFL1 (CsTFL) encodes a 19-kD protein with 74% and 61% identity to Arabidopsis TFL1 and CiFT, respectively (Pillitteri et al., 2004b). Two SOC1-like genes have been isolated in navel orange and named CsSL1 and CsSL2 (Tan and Swain, 2007). Overexpression of CiFT, CsLFY, CsAP1, or CsSLs induces an early flowering phenotype in Arabidopsis (Kobayashi et al., 1999; Pillitteri et al., 2004a; Tan and Swain, 2007), whereas Arabidopsis plants ectopically expressing CsTFL show late-flowering phenotypes (Pillitteri et al., 2004b). These observations are similar to those described for the overexpression of Arabidopsis FT, LFY, AP1, SOC1, or TFL1 (Kobayashi et al., 1999; Lee et al., 2000; Mandel and Yanofsky, 1995; Weigel and Nilsson, 1995). By transformation with flowering-related genes, shortening of the long juvenile period in citrus has been achieved (Endo et al., 2005; Peña et al., 2001). Ectopic expression of Arabidopsis AP1 or LFY caused early flowering and fruiting in many of the trangenic citranges, a hybrid of sweet orange and trifoliate orange (Poncirus trifoliata L. Raf. ), which initiated flowering in spring, 12–20 months after their transfer to the greenhouse (Peña et al., 2001). The control non-transformed plants normally initiated flowering only after five years of growth in the greenhouse. Constitutive expression of CiFT started to flower as early as 12 weeks after transfer to a greenhouse, whereas wild-type plants usually have a long juvenile period of several years (Endo et al., 2005). Most of the 35S::CiFT transgenic flowers developed on leafy inflorescences, apparently in place of thorns. In F1 progeny obtained by crossing ‘Kiyomi’ tangor (C. unshiu × sinensis) with the pollen of one transgenic line, extremely early flowering immediately after germination was observed. The phenotype of 35S::CiFT trifoliate orange seems to be distinct from that of 35S::LFY and 35S::AP1 citranges; the transgenic trifoliate orange carrying 35S::CiFT develops flowers repeatedly in the course of shoot growth, but the citrange carrying 35S::LFY or 35S::AP1 showed seasonal periodicity of flowering. In addition, extremely early flowering immediately after germination from seeds in nucellar and hybrid seedlings of the 35S:CiFT trifoliate orange is a novel phenotype, which was not observed in the case of the offspring of 35S:LFY or 35S:AP1 citranges. In 35S::CiFT trifoliate oranges, comparison of global transcriptional changes with the wild-type control showed that mRNA levels of 13 genes are increased in transgenic plants (Nishikawa et al., 2010). Among the genes showing higher expression in transgenic plants, homologues of some MADS-box genes, such as AP1, SEPALLATA1 and 3, and FRUITFULL, were included. The early flowering phenotype resulting from ectopic expression of CiFT has been used for rapid evaluation of transgenic citrus flowers and fruits (Endo et al., 2009). In this study, a gene encoding limonene synthase from satsuma mandarin was introduced into trifoliate orange in an anti-sense orientation with the CiFT co-expression vector and the effect on aroma-related genes in flowers and fruit was evaluated. Transgenic plants flowered extremely early; hence, this system yielded results within a short period (within 2 years of Agrobacterium infection). With regard to the seasonal periodicity of development, the genus Citrus is largely different from its close relatives, Poncirus and Fortunella (Fig. 1). Both Citrus and Fortunella are evergreen, whereas Poncirus is deciduous. In satsuma mandarin, floral induction occurs during fall and winter, floral organs are first observable from January through a microscope, and the tree blooms in May (Inoue, 1990b; Iwasaki, 1959). Kumquat (genus Fortunella) bloom during summer and fall and evocation of floral organ development is observed just before blooming (Abbott, 1935). In trifoliate orange (genus Poncirus), evocation occurs during early summer (Reuther et al., 1967). The development of flower buds ceases during fall and winter, then starts again and the tree blooms in spring. Schematic diagram of seasonal periodicity in flowering of three Rutaceae genera. Upper panel: Satsuma mandarin (C. unshiu Marcow). Middle panel:Trifoliate orange (Poncirus trifoliata L. Raf.). Lower panel: Kumquat (Fortunella). In the above-mentioned three genera, changes in CiFT expression are correlated with the seasonal periodicity of flowering (Fig. 2) (Nishikawa et al., 2007, 2009, 2011). In satsuma mandarin, CiFT expression increases during fall and winter, in which period floral induction occurs. This increase results from the expression of CiFT2 which is also induced during fall and winter in murcott mandarin (Citrus reticulate Blanco) (Shalom et al., 2012). In kumquat and trifoliate orange, CiFT expression increases during early summer, in which period evocation of flower organs has been initiated, or just before evocation. The mRNA levels of CsLFY remain low during floral induction (winter and fall) in satsuma mandarin; subsequently, levels increase in April, during which period floral organs develop rapidly. In kumquat and trifoliate orange, mRNA levels of CsLFY increase during summer, in which period floral induction and evocation occur. Expression levels of CsAP1 are relatively high during spring and summer and low during winter in the three genera. In all three genera, mRNA levels of CsTFL were detected at high levels during late spring or early summer, then decreased to undetectable levels. Thus, among the examined genes, only CiFT showed a close correlation with floral induction in all three genera. Seasonal expression of flowering-related genes in stems of vegetative shoots of satsuma mandarin (A), trifoliate orange (B), and kumquat (C). Data presented are the mean ± SE (n = 3). In most Citrus species, an important factor in floral induction is cool temperature, as described above. In satsuma mandarin trees exposed to cool temperature (15°C), CiFT expression increases concurrently with floral induction (Figs. 3 and 4) (Nishikawa et al., 2007). When the trees are grown at high temperature (25°C), vegetative growth is maintained and flowering is not induced (Fig. 3). At the same time, CiFT expression remains at a low level (Fig. 4). Thus, CiFT expression is regulated by temperature. In other flowering-related genes, such as CsLFY, CsAP1, and CsTFL, changes of mRNA levels show no association with the period of floral induction in trees placed in a growth room at 15°C (Figs. 3 and 4). In CsLFY and CsAP1, mRNA levels increase during the period of evocation of flower buds in satsuma mandarin and sweet orange trees under prolonged 15°C treatment or a subsequent shift to high temperature (Nishikawa et al., 2007; Pillitteri et al., 2004b). Endogenous CsLFY and CsAP1 may play a role in the evocation of organ development. Among the flowering-related genes investigated, only CiFT showed a close correlation with floral induction of trees under artificial flowering-regulated conditions. Floral induction in adult and juvenile satsuma mandarin trees grown under 15°C or 25°C. Floral induction was estimated by the number of flower buds observed after forcing the tree to sprout (by defoliation and placement at 25°C). Data presented are the mean ± SE (n = 3). Expression of flowering-related genes in stems of vegetative shoots. Adult and juvenile satsuma mandarin trees were grown under 15°C or 25°C. Data presented are the mean ± SE (n = 3). 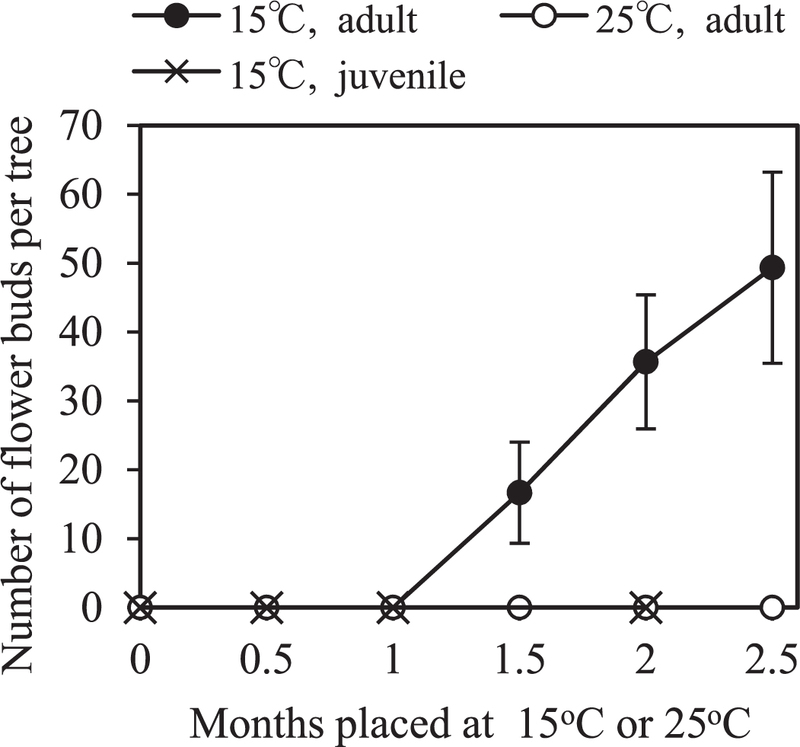 The increase in CiFT expression in response to cool temperature is observed only in adult trees and not in juvenile plants. In 4-month-old seedlings of satsuma mandarin, cool temperature treatment does not induce CiFT expression (Fig. 4) (Nishikawa et al., 2007). In young plants, CsTFL mRNAs are detected at higher levels than those of adult plants in trees of satsuma mandarin and sweet orange exposed to cool temperature (Fig. 4) (Nishikawa et al., 2007; Pillitteri et al., 2004b). It is hypothesized that the suppression of flowering in young plants might correlate with low CiFT expression and high CsTFL expression under cool-temperature conditions. Recently, changes in gene expression in response to fruit bearing have been reported in ‘Murcott’ (C. reticulata Blanco) (Shalom et al., 2012), ‘Moncada’ [Clementina ‘Oroval’ (C. clementina Hort. ex. Tan) × ‘Kara’ mandarin (C. unshiu Marcow. × C. nobilis Lour.)] (Muñoz-Fambuena et al., 2011), and satsuma mandarin (Nishikawa et al., 2012). In these genotypes, the levels of CiFT expression seem to be high in light-fruiting “off” trees and low in heavy-fruiting “on” trees during the floral inductive period. 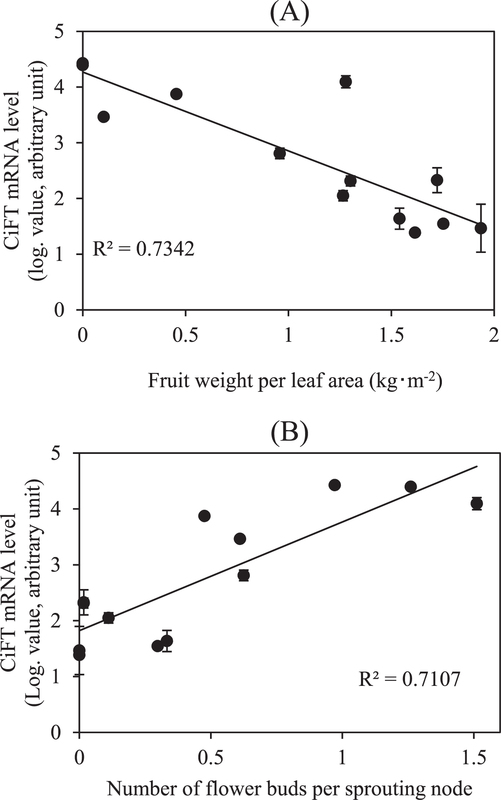 In satsuma mandarin, total CiFT expression during fall shows a clear and strong correlation with fruit weight per leaf area (Nishikawa et al., 2012) (Fig. 5A). This result indicates that fruit bearing suppresses CiFT expression in a manner dependent on the fruit amount. In addition, CiFT gene expression is associated with the timing of fruit harvest (Fig. 6). In this experiment, one tree was used with three primary branches, from which fruits or flowers were removed at different times. The CiFT expression level was high in the branch from which flowers were removed in May and low in the branch from which fruits were harvested in November. This indicates that CiFT expression is suppressed by a long fruit-bearing period and the suppression of CiFT expression by fruit bearing is limited to the vicinity to the fruit-bearing portion of the tree. 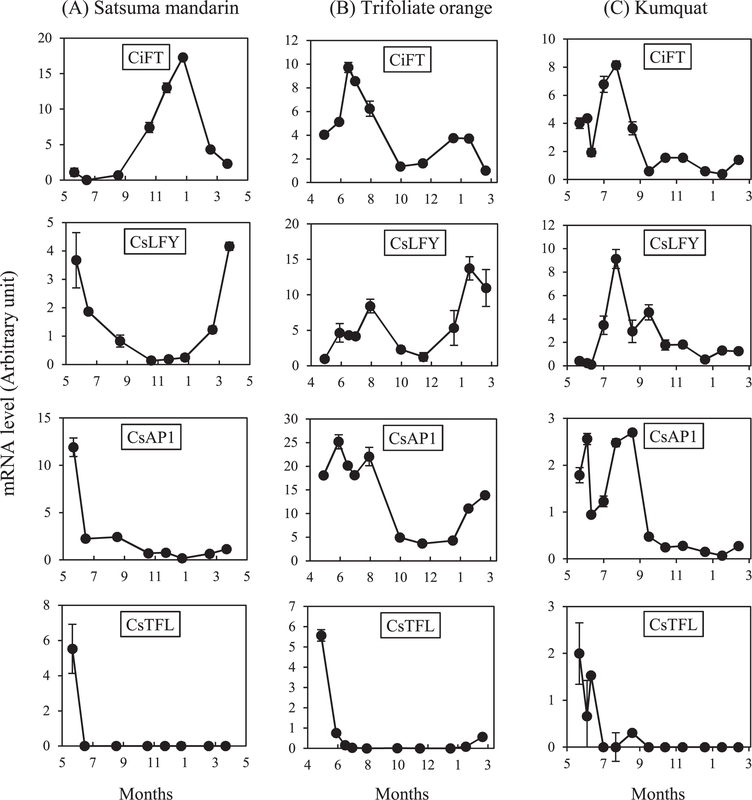 In these experiments, flower number in the following spring showed a positive and high correlation with CiFT expression levels during fall and winter (Figs. 5B and 6) (Nishikawa et al., 2012). Taken together, it is considered that excessive fruit amount, a longer period of fruit bearing, and the vicinity to the fruit-bearing portion of the tree reduce CiFT expression in the stems of vegetative shoots during fall and winter, and correspond with flower number in the following spring. Given that the flower number and CiFT expression show a close correlation (Figs. 5B and 6) (Nishikawa et al., 2012) and CiFT has a function in the promotion of flowering (Endo et al., 2005; Kobayashi et al., 1999), it is likely that fruit bearing suppresses flower number in the following spring via suppression of CiFT expression. Since alternate bearing is essentially caused by the suppression of floral induction by fruit bearing, studies on the regulation of CiFT expression may be important to understand the mechanism of alternate bearing. Correlation between CiFT mRNA levels and fruit weight per leaf area at harvest (A) and number of flower buds in the following spring (B). From each of 12 satsuma mandarin trees, approximately five vegetative shoots were collected in November and the stem was used for RNA extraction. Data for gene expression are presented as the mean (logarithmical value) ± SE (n = 3). 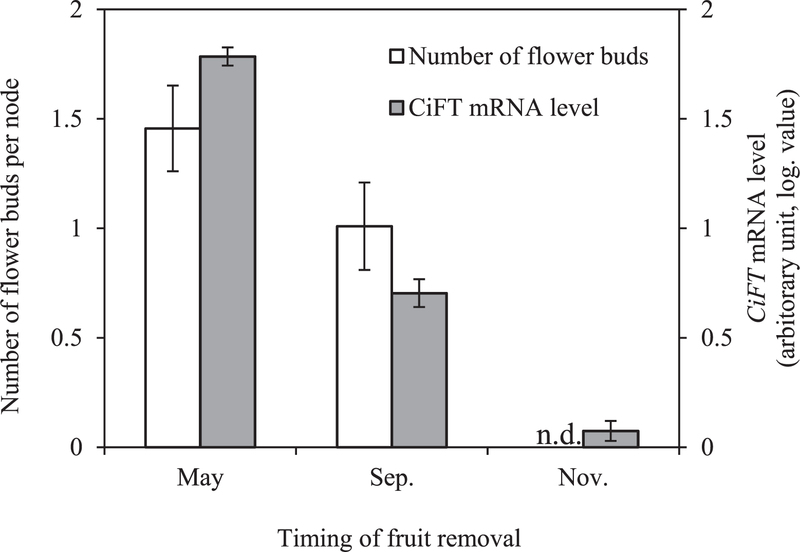 Flower number per node (white bar) and CiFT mRNA levels (gray bar) in the three primary branches from which all flowers or fruits were removed in May, September or November. In November, vegetative shoots were collected from each branch and the stems were used for RNA analysis. Data for CiFT mRNA levels are presented as the mean (logarithmical value) ± SE (n=3). The flower number per branch was counted in the following spring. Data for flower number per node are presented as the mean ± SE (n = 11). n.d., not detected. Defoliation often decreases flower number in the following spring and leads to alternate bearing. In satsuma mandarin, early leaf removal or a decrease in leaf number suppresses CiFT expression in trees grown under a floral-inductive condition (15°C) (Fig. 7) (Nishikawa et al., 2013). Parallel with CiFT expression, floral induction was suppressed in trees from which all leaves had been removed earlier or which carried fewer leaves (Fig. 7). Thus, defoliation suppresses both CiFT expression and floral induction. Floral induction (white bar) and CiFT mRNA levels (gray bar) in stems of satsuma mandarin trees completely defoliated at different times (A) or defoliated to different extents (B). (A) The potted trees were placed in a 15°C growth room for 2.5 months, during which all leaves were removed after 0, 0.5, 1, 1.5, or 2 months. Control plants were grown under 15°C without any leaf removal. (B) Plants were defoliated to 0, 50, 75, or 100% of the original leaf number, then the trees were placed in a 15°C growth room for one month. In both experiments, at the end of the 15°C treatment the trees were completely defoliated and sprouting forced at 25°C. Then, flower buds were counted to assess floral induction. Data for the number of flower buds are the mean ± SE (n = 3 (A), n = 5 (B)). In both experiments, at the end of the 15°C treatment, vegetative shoots were collected from each plant and the stems were used for RNA analysis. Gene expression data are presented as the mean (logarithmical value) ± SE (n = 3). n.d., not detected. Gibberellin, an inhibitor of flowering in citrus, reduces CiFT expression in buds of Orri mandarin (C. reticulata Blanco × C. temple Hort. ex Y. Tanaka) (Goldberg-Moeller et al., 2013) and leaves of sweet orange (Muñoz-Fambuena et al., 2012). In sweet orange, paclobutrazol, a GA biosynthesis inhibitor, increases flowering by enhancing CiFT expression (Muñoz-Fambuena et al., 2012), which indicates that endogenous GA can inhibit flowering via suppression of CiFT expression. In the citrus industry, the flowering behavior of citrus trees may cause several problems, and affects not only fruit production, but also breeding and genetic studies. In this review, accumulated data were summarized that indicate CiFT to be a key gene in the flowering of citrus and a useful tool in the shortening of the juvenile period. A CiFT co-expression system has been developed for rapid evaluation of the flowers and fruits of transgenic plants. This technique will contribute to the production of commercially desirable transgenic plants for use in the pharmaceutical and agrochemical industries. Studies of endogenous CiFT expression strongly support the hypothesis that endogenous CiFT regulates floral induction and affects flower number in the following spring under various conditions. Information on various factors that affect floral induction, such as temperature, fruit bearing, defoliation, and GA, seems to integrate CiFT expression. In citrus, floral induction occurs and progresses invisibly. This has disrupted accurate monitoring of floral induction, which is essential in studies aimed at the development of cultural techniques for the regulation of flower number. In such studies, the CiFT expression level may be helpful to evaluate floral induction. 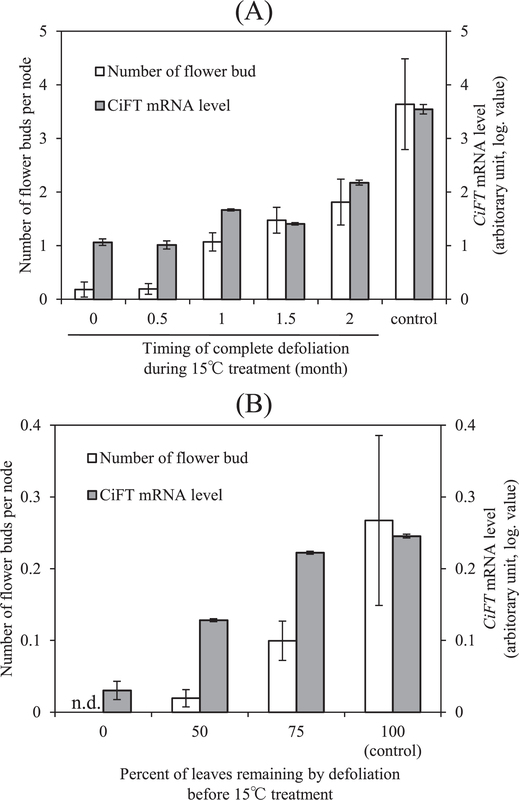 The mRNA level of CiFT can also be used to predict flower number because the CiFT mRNA level during fall shows a positive and strong correlation with flower number in the following spring. Such prediction at an earlier developmental stage will be valuable to enable adjustment of flower number and prevent alternate bearing. Recently, several global gene expression analysis and proteomic approaches relating to flowering have been conducted in citrus (Goldberg-Moeller et al., 2013; Muñoz-Fambuena et al., 2013; Shalom et al., 2012). Further study employing the profiling of transcripts, proteins, or metabolites will provide a fuller understanding of the mechanism of flowering regulation in citrus, and will contribute to the resolution of flowering-related problems such as juvenility and alternate bearing. Abbott, C. 1935. Blossom-bud differentiation in citrus trees. Amer. J. Bot. 22: 476–485. Böhlenius, H., T. Huang, L. Charbonnel-Campaa, A. M. Brunner, S. Jansson, S. H. Strauss and O. Nilsson. 2006. CO/FT regulatory module controls timing of flowering and seasonal growth cessation in trees. Science 312: 1040–1043. Corbesier, L., C. Vincent, S. Jang, F. Fornara, Q. Fan, I. Searle, A. Giakountis, S. Farrona, L. Gissot, C. Turnbull and G. Coupland. 2007. FT protein movement contributes to long-distance signaling in floral induction of Arabidopsis. Science 316: 1030–1033. Davenport, T. 1990. Citrus flowering. Hort. Rev. 12: 349–408. Dornelas, M., R. Camargo, L. Figueiredo and M. Takita. 2007. A genetic framework for flowering-time pathways in Citrus spp. Genet. Mol. Biol. 30: 769–779. Endo, T., T. Shimada, H. Fujii, Y. Kobayashi, T. Araki and M. Omura. 2005. Ectopic expression of an FT homolog from Citrus confers an early flowering phenotype on trifoliate orange (Poncirus trifoliata L. Raf.). Transgenic Res. 14: 703–712. Endo, T., T. Shimada, H. Fujii, F. Nishikawa, A. Sugiyama, M. Nakano, T. Shimizu, Y. Kobayashi, T. Araki, L. Peña and M. Omura. 2009. Development of a CiFT co-expression system for functional analysis of gene in citrus flowers and fruit. J. Japan. Soc. Hort. Sci. 78: 74–83. Garcia-Luis, A., V. Almela, C. Monerri, M. Agustí and J. Guardiola. 1986. Inhibition of flowering in vivo by existing fruits and applied growth regulators in Citrus unshiu. Physiol. Plant. 66: 515–520. Garcia-Luis, A., F. Fornes and J. Guardiola. 1995. Leaf carbohydrates and flower formation in citrus. J. Amer. Soc. Hort. Sci. 120: 222–227. Goldberg-Moeller, R., L. Shalom, L. Shlizerman, S. Samuels, N. Zur, R. Ophir, E. Blumwald and A. Sadka. 2013. Effects of gibberellin treatment during flowering induction period on global gene expression and the transcription of flowering-control genes in Citrus buds. Plant Sci. 198: 46–57. Goldschmidt, E. E., N. Aschkenazi, Y. Herzano, A. A. Schaffer and S. P. Monselise. 1985. A role for carbohydrate levels in the control of flowering in citrus. Sci. Hortic. 26: 159–166. Gyllenstrand, N., D. Clapham, T. Källman and U. Lagercrantz. 2007. A Norway spruce FLOWERING LOCUS T homolog is implicated in control of growth rhythm in conifers. Plant Physiol. 144: 248–257. Hendry, N., J. Vanstaden and P. Allan. 1982. Cytokinins in citrus. I. Fluctuations in the leaves during seasonal and developmental changes. Sci. Hortic. 16: 9–16. Hepworth, S., F. Valverde, D. Ravenscroft, A. Mouradov and G. Coupland. 2002. Antagonistic regulation of flowering-time gene SOC1 by CONSTANS and FLC via separate promoter motifs. EMBO J. 21: 4327–4337. Inoue, H. 1989a. Differentiation and development of flower buds in satsuma mandarin under different temperature conditions. J. Japan. Soc. Hort. Sci. 58: 75–82 (In Japanese with English summary). Inoue, H. 1989b. Effects of soil drought and temperature on flower bud differentiation of satsuma mandarin. J. Japan. Soc. Hort. Sci. 58: 581–585 (In Japanese with English summary). Inoue, H. 1990a. Effects of gibberellic acid spray and temperature in summer and autumn on shoot sprouting and flower bud differentiation of satsuma mandarin. J. Japan. Soc. Hort. Sci. 58: 913–917 (In Japanese with English summary). Inoue, H. 1990b. Effects of temperature on bud dormancy and flower bud differentiation in satsuma mandarin. J. Japan. Soc. Hort. Sci. 58: 919–926 (In Japanese with English summary). Inoue, H. and Y. Harada. 1988. Tree growth and nutrient absorption of young satsuma mandarins under different temperature conditions. J. Japan. Soc. Hort. Sci. 57: 1–7 (In Japanese with English summary). Inoue, H. and Y. Ikoma. 1991. Effects of autumn ringing and BA sprays on flower bud differentiation and development of satsuma mandarin. J. Japan. Soc. Hort. Sci. 60: 285–290 (In Japanese with English summary). Inoue, H., Y. Ikoma and I. Kataoka. 1991. Effects of ringing and temperature on flower bud differentiation of satsuma mandarin. J. Japan. Soc. Hort. Sci. 60: 275–284 (In Japanese with English summary). Iwahori, S., A. Garcia-Luis, P. Santamarina, C. Monerri and J. Guardiola. 1990. The influence of ringing on bud development and flowering in satsuma mandarin. J. Exp. Bot. 41: 1341–1346. Iwasaki, T. 1959. Studies on the differentiation and development of the flower bud in citrus. Bull. Hort. Sta. National Tokai-Kinki Agric. Exp. Sta. 5: 4–35 (In Japanese with English summary). Jack, T. 2004. Molecular and genetic mechanisms of floral control. Plant Cell 16: S1–S17. Kobayashi, Y., H. Kaya, K. Goto, M. Iwabuchi and T. Araki. 1999. A pair of related genes with antagonistic roles in mediating flowering signals. Science 286: 1960–1962. Komeda, Y. 2004. Genetic regulation of time to flower in Arabidopsis thaliana. Annu. Rev. Plant Biol. 55: 521–535. Koshita, Y. and T. Takahara. 2004. Effect of water stress on flower-bud formation and plant hormone content of satsuma mandarin (Citrus unshiu Marc.). Sci. Hortic. 99: 301–307. Koshita, Y., T. Takahara, T. Ogata and A. Goto. 1999. Involvement of endogenous plant hormones (IAA, ABA, GAs) in leaves and flower bud formation of satsuma mandarin (Citrus unshiu Marc.). Sci. Hortic. 79: 185–194. Lee, H., S. S. Suh, E. Park, E. Cho, J. H. Ahn, S. G. Kim, J. S. Lee, Y. M. Kwon and I. Lee. 2000. The AGAMOUS-LIKE 20 MADS domain protein integrates floral inductive pathways in Arabidopsis. Genes. Dev. 14: 2366–2376. Lenz, F. 1969. Effects of day length and temperature on the vegetative and reproductive growth of ‘Washington Navel’ orange. Proc. First Int. Citrus Symp. 1: 333–338. Mandel, M. and M. Yanofsky. 1995. A gene triggering flower formation in Arabidopsis. Nature 377: 522–524. Martínez-Fuentes, A., C. Mesejo, C. Reig and M. Agustí. 2010. Timing of the inhibitory effect of fruit on return bloom of ‘Valencia’ sweet orange (Citrus sinensis (L.) Osbeck). Sci. Food. Agr. 90: 1936–1943. Monselise, S. and E. Goldschmidt. 1982. Alternate bearing in fruit trees. Hort. Rev. 4: 128–173. Monselise, S. and H. Halevy. 1964. Chemical inhibition and promotion of citrus flower bud induction. Proc. Amer. Soc. Hort. Sci. 84: 141–146. Moss, G. 1976. Temperature effects on flower initiation in sweet orange (Citrus sinensis). Aust. J. Agric. Res. 27: 399–407. Muñoz-Fambuena, N., C. Mesejo, M. Agustí, S. Tárraga, D. Iglesias, E. Primo-Millo and M. González-Mas. 2013. Proteomic analysis of “Moncada” mandarin leaves with contrasting fruit load. Plant Physiol. Biochem. 62: 95–106. Muñoz-Fambuena, N., C. Mesejo, M. González-Mas, D. Iglesias, E. Primo-Millo and M. Agustí. 2012. Gibberellic acid reduces flowering intensity in sweet orange [Citrus sinensis (L.) Osbeck] by repressing CiFT gene expression. J. Plant Growth Regul. 31: 529–536. Muñoz-Fambuena, N., C. Mesejo, M. González-Mas, E. Primo-Millo, M. Agustí and D. Iglesias. 2011. Fruit regulates seasonal expression of flowering genes in alternate-bearing ‘Moncada’ mandarin. Ann. Bot. 108: 511–519. Nakajima, Y., S. Susanto and K. Hasegawa. 1993. Influence of water stress in autumn on flower induction and fruiting in young pomelo trees (Citrus grandis (L.) Osbeck). J. Japan. Soc. Hort. Sci. 62: 15–20. Nambu, H. 1934. The flowering habit and the fruit bud formation in Citrus. Studia Citrologia 5: 21–32 (In Japanese with English summary). Nishikawa, F., T. Endo, T. Shimada, H. Fujii, T. Shimizu, Y. Kobayashi, T. Araki and M. Omura. 2010. Transcriptional changes in CiFT-introduced transgenic trifoliate orange (Poncirus trifoliata L. Raf.). Tree Physiol. 30: 431–439. Nishikawa, F., T. Endo, T. Shimada, H. Fujii, T. Shimizu and M. Omura. 2009. Differences in seasonal expression of flowering genes between deciduous trifoliate orange and evergreen satsuma mandarin. Tree Physiol. 29: 921–926. Nishikawa, F., T. Endo, T. Shimada, H. Fujii, T. Shimizu, M. Omura and Y. Ikoma. 2007. Increased CiFT abundance in the stem correlates with floral induction by low temperature in satsuma mandarin (Citrus unshiu Marc.). J. Exp. Bot. 58: 3915–3927. Nishikawa, F., M. Iwasaki, H. Fukamachi and T. Endo. 2013. Leaf removal suppresses citrus FLOWERING LOCUS T expression in satsuma mandarin. Bull. Natl. Fruit Tree Sci. 15: 1–6. Nishikawa, F., M. Iwasaki, H. Fukamachi, K. Nonaka, A. Imai and T. Endo. 2011. Seasonal changes of citrus FLOWERING LOCUS T gene expression in kumquat. Bull. Natl. Fruit Tree Sci. 12: 27–32. Nishikawa, F., M. Iwasaki, H. Fukamachi, K. Nonaka, A. Imai, F. Takishita, T. Yano and T. Endo. 2012. Fruit bearing suppresses citrus FLOWERING LOCUS T expression in vegetative shoots of satsuma mandarin (Citrus unshiu Marc.). J. Japan. Soc. Hort. Sci. 81: 48–53. Ogata, T., H. Hasukawa, S. Shiozaki, S. Horiuchi, K. Kawase, I. Iwagaki and H. Okuda. 1996. Seasonal changes in endogenous gibberellin contents in satsuma mandarin during flower differentiation and the influence of paclobutrazol on gibberellin synthesis. J. Japan. Soc. Hort. Sci. 65: 245–253 (In Japanese with English summary). Ogata, T., Y. Ueda, S. Shiozaki, S. Horiuchi and K. Kawase. 1995. Effects of gibberellin synthesis inhibitors on flower setting of satsuma mandarin. J. Japan. Soc. Hort. Sci. 64: 251–259 (In Japanese with English summary). Okuda, H., T. Kihara and I. Iwagaki. 1996. Effects of fruit removal on photosynthesis, stomatal conductance and ABA level in the leaves of vegetative shoots in relation to flowering of satsuma mandarin. J. Japan. Soc. Hort. Sci. 65: 15–20. Okuda, H., K. Noda, T. Kihara and T. Hirabayashi. 2002. Fine root volume, flowering, sprouting, and carbohydrate content in the leaves and roots of bearing and non-bearing satsuma mandarin trees in a systemized alternate-bearing orchard. J. Japan. Soc. Hort. Sci. 71: 588–590 (In Japanese with English summary). Peña, L., M. Martín-Trillo, J. Juárezl, J. Pina, L. Navarro and J. Martínez-Zapater. 2001. Constitutive expression of Arabidopsis LEAFY or APETALA1 genes in citrus reduces their generation time. Nat. Biothechnol. 19: 263–267. Pillitteri, L., C. Lovatt and L. Walling. 2004a. Isolation and characterization of a TERMINAL FLOWER homolog and its correlation with juvenility in citrus. Plant Physiol. 135: 1540–1551. Pillitteri, L., C. Lovatt and L. Walling. 2004b. Isolation and characterization of LEAFY and APETALA1 homologues from Citrus sinensis L. Osbek ‘Washington’. J. Amer. Soc. Hort. Sci. 129: 846–856. Pin, P. and O. Nilsson. 2012. The multifaceted roles of FLOWERING LOCUS T in plant development. Plant Cell Environ. 35: 1742–1755. Ratcliffe, O., I. Amaya, C. Vincent, S. Rothstein, R. Carpenter, E. Coen and D. Bradley. 1998. A common mechanism controls the life cycle and architecture of plants. Development 125: 1609–1615. Ratcliffe, O., D. Bradley and E. Coen. 1999. Separation of shoot and floral identity in Arabidopsis. Development 126: 1109–1120. Reuther, W. 1973. Climate and citrus behavior. p. 280–337. In: W. Reuther (ed.). The citrus industry, Vol. III. University of California, Berkeley. Reuther, W., L. D. Batchelor and H. J. Webber. 1967. The citrus industry, Vol. I: History, world distribution, botany, and varieties. University of California, Berkeley. Robles, P. and S. Pelaz. 2005. Flower and fruit development in Arabidopsis thaliana. Int. J. Dev. Biol. 49: 633–643. Rodriguez-Falcon, M., J. Bou and S. Prat. 2006. Seasonal control of tuberizaion in potato: conserved elements with the flowering response. Annu. Rev. Plant Biol. 57: 151–180. Sato, K., K. Sugihara, M. Iwasaki and H. Okuda. 2007. Effect of NAA on the flowering ability and concentration of nutritional elements in the leaves and shoots of satsuma mandarin grown in an early heating plastic house. Hort. Res. (Japan) 6: 553–557 (In Japanese with English summary). Shalom, L., S. Samuels, N. Zur, L. Shlizerman, H. Zemach, M. Weissberg, R. Ophir, E. Blumwald and A. Sadka. 2012. Alternate bearing in citrus: changes in the expression of flowering control genes and in global gene expression in ON-versus OFF-Crop Trees. PLoS One 7: e46930 DOI: 10.1371/journal.pone.00430. <http://www.plosone.org/>. Shannon, S. and D. Meeks-Wagner. 1993. Genetic interactions that regulate inflorescence development in Arabidopsis. Plant Cell 5: 639–655. Shimizu, T., H. Torikata and S. Torii. 1978. Studies on the effect of crop load on the composition of satsuma mandarin trees. V. Analysis of production processes of bearing and non-bearing trees based on the carbohydrate economy. J. Japan. Soc. Hort. Sci. 46: 465–478 (In Japanese with English summary). Southwick, S. and T. Davenport. 1986. Characterization of water stress and low temperature effects on flower induction in citrus. Plant Physiol. 81: 26–29. Takagi, T., A. Tomiyasu, M. Matsushima and T. Suzuki. 1989. Seasonal changes of GA-like substances in fruit and current shoots of satsuma mandarin trees. J. Japan. Soc. Hort. Sci. 58: 569–573 (In Japanese). Tamaki, S., S. Matsuo, HL. Wong, S. Yokoi and K. Shimamoto. 2007. Hd3a protein is a mobile flowering signal in rice. Science 316: 1033–1036. Tan, FC. and S. Swain. 2007. Functional characterization of AP3, SOC1 and WUS homologues from citrus (Citrus sinensis). Physiol. Plant. 131: 481–495. Weigel, D. and O. Nilsson. 1995. A developmental switch sufficient for flower initiation in diverse plants. Nature 377: 495–500. Wilkie, J., M. Sedgley and T. Olesen. 2008. Regulation of floral initiation in horticultural trees. J. Exp. Bot. 59: 3215–3228. Yahata, D., Y. Oba and M. Kuwahara. 1995. Changes in carbohydrate levels, α-amylase activity, indoleacetic acid and gibberellin-like substances in the summer shoots of wase satsuma mandarin trees grown indoors during flower-bud differentiation. J. Japan. Soc. Hort. Sci. 64: 527–533 (In Japanese with English summary). Yoshida, T., H. Nesumi, T. Yoshioka, M. Nakano, Y. Ito, S. Murase and F. Takishita. 2005. New citrus cultivar ‘Harehime’. Bull. Natl. Inst. Fruit Tree Sci. 4: 37–45 (In Japanese with English summary).